Introduction: Heart Transplant in India started in 1994. We were initially doing 1-2 per year but the numbers have picked up since 2014 and we have done 25 in the past 3 years. We describe our experience of the last 4 years in this paper. Results: Initially, we experienced a relatively higher rate of rejections, fungal infections and graft failure. As we changed protocols, stopped using induction therapy except in high risk, maintained higher levels of immune suppression and tapered steroids faster in the first year, the complications reduced. All patients who had rejections and all the later transplants were maintained on a regime of tacrolimus, mycophenolate mofetil and steroids along with six months of valgancyclovir, voriconazole and co-trimoxazole. Steroids were tapered by six months to 0.1 mg/kg per day in all patients. Conclusions: In our recent patients, infection was the most common adverse event followed by rejection and PGD. In the latter half of our experience, we found that the complications reduced, suggesting that experience leads to less complications. Heart transplant remains the gold standard for the treatment of end-stage heart failure. The first successful heart transplant in India was done at the All India Institute of Medical Sciences (AIIMS), New Delhi on August 3, 1994. The patient survived for 14 years. The longest surviving recipient at our institute is currently 16-year postheart transplant. Two decades later, the transplant program has not progressed in the way it should have progressed in India. In the recent past, there has been an increase in the number of centers performing heart transplant. A new organization by the name of National Organ and Tissue Transplantation Organization (NOTTO) has also come into existence which not only records, regulates, and facilitates organ transplantation but also creates awareness by its various outreach programs and activities., This has led to an increase in the number of heart donors in the past 3 years. Although the increase in percentage may not seem very significant, it is a positive trend. At our institute also, there has been a surge in the number of heart transplant surgeries in the past 3 years (31 transplants in 1994–2014 and 25 in 2014–2017). With the increase in volumes, we have learned a number of lessons and fine-tuned our protocols for India. In this paper, we describe our experience in the past 3 years. After obtaining permission from the hospital Ethics Committee, records of 25 heart transplant recipients who underwent heart transplant from July 1, 2014 to June 30, 2017, were retrospectively analyzed. All patients were followed at least for 4 months. This is similar to the protocols followed the world over with evaluation of the functions of all systems including liver and kidneys, samples for microbiological surveillance cultures from different sites, serologies to demonstrate cytomegalovirus (CMV), hepatitis B and C, and HIV infection. We have also added a non-contrast computerized tomography scan of the brain, chest, and abdomen to rule out any abnormalities and especially evidence of tuberculosis. We actively look for reversible causes of respiratory and cardiac causes of dyspnea. Dental evaluation and treatment are done for all patients. In the preoperative period, oral cyclosporine in a dose of 3 mg/kg and mycophenolate mofetil in a dose of 10 mg/kg was given along with other premedication. In some of the recent patients, we have switched to tacrolimus instead of cyclosporine as standard therapy because the occurrence of rejections had increased with cyclosporine. It was also difficult to maintain therapeutic levels of cyclosporine in most of the patients with the available generic preparations of cyclosporine in the market. We have also switched to mycophenolate mofetil from azathioprine which was used in the initial phases of the program. We used methylprednisolone 500 mg intravenously at the time of release of aortic cross clamp and then 8 hourly to complete a total of three doses, then 1 mg/kg/day intravenously divided into two doses till the target cyclosporine/tacrolimus levels were achieved. After the first biopsy (7–10 days), oral prednisolone was given in a 1 mg/kg/day dose. Prednisolone was tapered on a weekly basis in otherwise asymptomatic patients at a rate of 5 mg/week till a dose of 5 mg/day was achieved. This dose of prednisolone was continued. Cyclosporine was started orally on postoperative day 1 in a dose of 2–3 mg/kg/day in two divided doses to achieve a target trough level of 300–350 ng/ml. The following levels were maintained: <6 weeks, 300–350 ng/ml; 6 weeks–3 months, 250–300 ng/ml; 3–6 months, 200–250 ng/ml; and >6 months, 200 ng/ml. Patients who suffered one episode of rejection were switched over to tacrolimus. The following levels were maintained: <2 months, 10–15 ng/ml; 2–6 months, 8–12 ng/ml, and >6 months, 5–10 ng/ml. The dose of mycophenolate mofetil was modified so as to maintain total leukocyte count in the range of 5000–7000/μl. All patients underwent heart transplant as per institute protocol. Bacterial prophylaxis was provided with intravenous (IV) Ceftazidime and Teicoplanin for 48–72 h. Oral valganciclovir 900 mg once daily was used to prevent CMV infection. Oral voriconazole in a dose of 3 mg/kg (200 mg) twice daily was used for fungal prophylaxis. Oral cotrimoxazole (trimethoprim 160 mg and sulfamethoxazole 800 mg) once daily prevented against Toxoplasma gondii and Pneumocystis jirovecii infection. After discharge from the hospital, recipients were followed up every week, till 1-month posttransplant; then, every 15 days, till 6-month posttransplant; then every month, till 1-year posttransplant; and then every 3 months, thereafter. First biopsy was done within 1st week of transplant, then every month for 1 year, and then every year. Methylprednisolone intravenously 20 mg/kg (up to a maximum of 1 g/day) divided into two equal doses for 3 days, then 1 mg/kg/day. Patients not responding till 1 week after were given rabbit antithymocyte globulin (ATG) in a dose of 1.5 mg/kg/day for duration of 7–10 days. Methylprednisolone intravenously 20 mg/kg (up to a maximum of 1 g/day) divided into two equal doses for 3 days, then 1 mg/kg/day. If there was no improvement in 1 week or the patients clinical condition, deteriorated rituximab was administered intravenously in a dose of 500 mg. The patient was premedicated with IV promethazine (50 mg); hydrocortisone (100 mg), and paracetamol (1 gram) before giving rituximab. Plasmapheresis was done on alternate days with administration of IV immunoglobulin (IVIg) in a dose of 0.5 mg/kg, after every cycle of plasmapheresis. With each plasmapheresis, 15 ml/kg of fresh frozen plasma and 4 ml/kg of 20% albumin were exchanged with plasma. Five such cycles were done and the patient reassessed for any further intervention. The mean age of recipients was 28.64 ± 14.63 years with 4 children and 21 adults. Most common cause of transplant was dilated cardiomyopathy (72%). Two recipients were moribund (INTERMACS 1) at the time of transplant whereas four others were in INTERMACS 2 and two in INTERMACS 3 class. Other characteristics of the recipients are shown in [Table 1]. One patient underwent extra corporeal Cardiopulmonary Resuscitation (eCPR) and was on extracorporeal membrane oxygenation and IABP both, preoperatively. From 2014 to 2017, the volume of transplants increased as we started doing donor harvesting from outside Delhi leading to an increase in the donor pool. With an increase in the transplant numbers, there was also an increase and then a decrease in the rate of complications as the surveillance and treatment protocols were revised. Arrhythmias can occur posttransplant. Three patients had rhythm disturbances. One had a complete heart block which developed 1 year after heart transplant when he was recovering from an episode of autoimmune encephalitis. He was implanted with a dual chamber pacemaker for his heart block. A second patient developed supraventricular tachycardia which responded to diltiazem and short-term anticoagulation. A third patient comes with multiple episodes of sinus tachycardia with a rate of 140 beats/min with a normal ventricular function. She was kept on close monitoring, and 1 week later, the echocardiogram showed asymptomatic left ventricular systolic dysfunction which responded to pulse therapy with methylprednisolone. Renal dysfunction postheart transplant is very common. Usually after heart transplant, there is an increase in the urine output in the first 48 h as the cardiac output increases. After this, the urine output starts to fall. Our protocol at this stage is to support the urine output (>1 ml/kg/h) and the kidneys by a judicious use of fluids to maintain right atrial pressures above 12–15 mmHg and systolic blood pressure >120 mm with multiple inotropes along with intermittent shots of diuretics such as frusemide). This usually ensures that most patients can do without dialysis. Three patients out of the 25 required hemodialysis in spite of all these precautions. If patients require dialysis and the renal function is subnormal, we depend on high-dose steroids for immunosuppression and withhold cyclosporine/tacrolimus for the duration. Six patients received induction therapy with two doses of basiliximab. The infection rates were very high after induction therapy including tuberculosis in two patients (lung and spinal), fungal infection in one, and bacterial infection (Pseudomonas and Klebsiella) in two. Following this, we stopped the elective use of induction therapy. Infections are common after transplant. In the early posttransplant period, the infection we have encountered has been mostly bacterial and has responded to empirical antibiotic therapy and occasionally based on the culture reports. Three patients developed fungal pneumonia out of which two were treated with liposomal Amphotericin B and one was treated with oral Posaconazole for 6 weeks [Figure 1] and [Figure 2] One had varicella pneumonia which was treated successfully. The bacteria encountered have included Pseudomonas, Klebsiella and Mycobacterium tuberculosis. The patient with Potts Spine responded to anti-tubercular therapy. 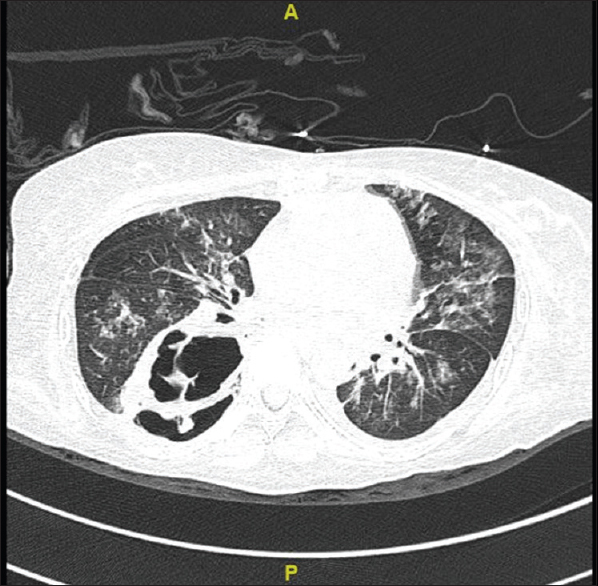 Figure 1: Noncontrast computed tomography of chest of an adult female with Aspergillus pneumonia. In addition, the patient developed Klebsiella pneumonia and succumbed to sepsis after 1 month. 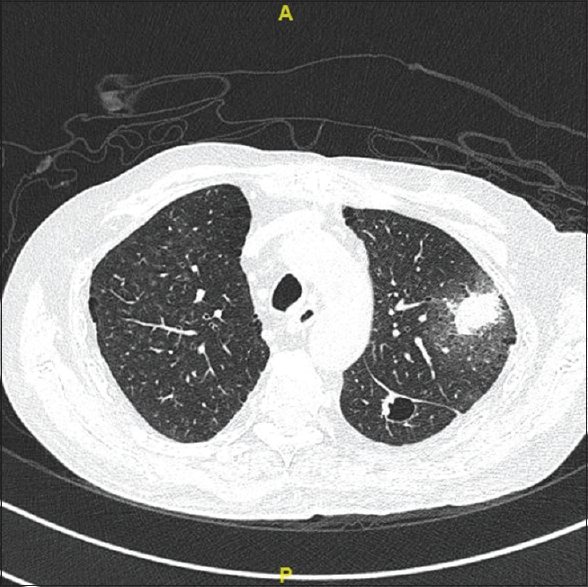 Figure 2: Noncontrast computed tomography chest of an adult male with Aspergillus pneumonia. The patient was successfully treated and is now 15 months postheart transplant. One patient developed autoimmune encephalitis 1 year after transplant which presented as a febrile illness worsening rapidly resulting in respiratory failure and ventilation and tracheostomy. He was treated with pulse steroids and IVIg and responded dramatically and then went on to develop a complete heart block, for which he received a pacemaker. He is now doing well. One patient developed a subdural hematoma which required multiple evacuations after which the patient is stable. Three children developed seizures and all were administered antiepileptics. One child developed posterior reversible encephalopathy syndrome because of high blood pressure and his transplanted adult heart. His symptoms were relieved with strict blood pressure control. One patient developed steroid psychosis within a week of the transplant with hyperactivity which was controlled with olanzapine as the steroids could not be tapered so soon after the transplant. Three weeks later, she reverted to normal as the steroids got tapered to low doses. Seven recipients out of 25 developed primary graft failure (PGD) in the immediate postoperative period. Out of the seven recipients who developed PGD, two had ischemia time >4 h (4 h is the ischemia time cutoff described for safe transplant). Only one out of seven was right ventricle PGD and rest six had moderate PGD (left ventricular ejection fraction [LVEF] <40%) of left ventricle. None of the patients who had completed 1-year follow-up showed coronary allograft vasculopathy (CAV) on angiograms done at 1 year. One patient whose recent coronary angiogram had looked normal, died a few months later of severe rejection and graft failure and the autopsy showed severe coronary graft atherosclerosis. During the 3 years, the first 1½ years had a higher incidence of adverse events as the number of transplants started rising. This was expected as the volumes increased. This was in the form of recurrent infections, some were bacterial, some were viral and some were fungal, and two were tubercular. We also realized that induction with basiliximab was leading to increased infections. 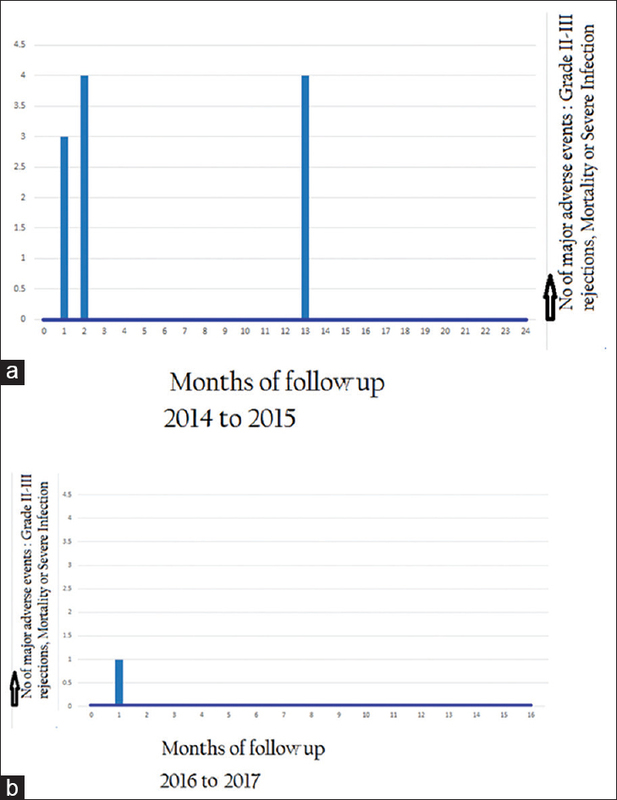 Switching to valganciclovir and voriconazole for prophylaxis and maintaining higher levels of cyclosporine or tacrolimus along with a more rapid tapering of steroids reduced the incidence of infections. We also became more aggressive with treating rejections with more rapid biopsies and the use of ATG and plasmapheresis and rituximab as per need. This improved the response to difficult rejections. We also made our recipient selection criteria more stringent and ensured that patients with preexisting evidence of infection were not listed till all evidence of infection had been eliminated. This is reflected in the event rates in [Figure 4]a and [Figure 4]b where [Figure 4]a represents the first half of the study period and [Figure 4]b represents the second half of the study period. Figure 4: (a and b) Major adverse events (major rejections and infections or mortality). There are many factors which are responsible for the lack of an upsurge in the number of heart transplant surgeries in India. Being a developing country, there are only a few hospitals that have the infrastructure to perform a transplant. Out of the civilian government hospitals, till date, only AIIMS at New Delhi runs a successful heart transplant program. There is also a lack of infrastructure to promptly identify potential donors and transport the harvested heart to the destined center in the stipulated time. NOTTO has taken this challenge and has improved the rate of donations and streamlined the organ allocation throughout the country, but it is still in its nascent stage. All the patients who were transplanted had cardiomyopathy with dilated cardiomyopathy being the most common cause for transplant (72%). Infection was the most common adverse event after heart transplant followed by rejection and PGD in that order. The incidence of PGD after cardiac transplantation is between 2.3% and 28.2%. In our study group, 7 (28%) recipients out of 25 developed PGD in the immediate postoperative period. Many risk factors both for donor and recipient have been described for the development of PGD. Out of the seven recipients who developed PGD, two had ischemia time >4 h (4 h is the ischemia time cutoff described for safe transplant). Only one out of seven was right ventricle PGD and rest six had moderate PGD (LVEF <40%) of left ventricle. A study done by Seguchi et al. documented the incidence of PGD to be 9.8% with similar midterm survival for recipients with or without PGD. PGD predisposes the patient to long-term Intensive Care Unit (ICU) stay and hospital-acquired infections. Three patients who developed sepsis within 30 days of transplant had acquired Klebsiella and Pseudomonas spp. during their prolonged stay in the ICU. Heart transplant recipients, even after discharge, are at an increased risk of infection due to immunosuppression. Being a developing country, certain diseases such as malaria, enteric fever, tuberculosis, influenza, and amebiasis are common in India. Furthermore, patients who belong to the low socioeconomic group or are below poverty line are exposed to communicable diseases on day-to-day basis. Five patients out of 25 recipients being described belonged to the low socioeconomic group (three were below poverty line). The most common complaint of patients during the follow-up period was fever. To aggravate the problem, antibiotic resistance is increasing day by day. There was no hyperacute rejection in any patient after the surgery. Cell-mediated rejection was more common than antibody-mediated rejection. Out of the seven recipients who developed cell-mediated rejection in the follow-up period, three had infection preceding the rejection episode and two were noncompliant with their immunosuppressive medication. In one patient, the antibody-mediated rejection was preceded by infection and in the other by administration of antirabies vaccine. There was no correlation between mortality and either infection (Spearman Rho coefficient = 0.036; P = 0.863) or rejection (Spearman Rho coefficient = 0.000; P = 1.000) posttransplant. CAV is a common cause of mortality between 1 and 3 years posttransplant. The incidence varies between 42% and 75% depending on the modality of investigation. The risk factors for CAV are age, gender, obesity, dyslipidemia, diabetes mellitus, hypertension, smoking, acute rejection, and histocompatibility mismatch at the time of transplant. One patient in our study group who developed CAV was a male patient of 47 years with diabetes, hypertension, and one episode of rejection in the 1st postoperative year. He presented with acute onset, progressive breathlessness, and severe left ventricular dysfunction 1 year posttransplant. His endomyocardial biopsy did not show any rejection and his angiography was also unremarkable. However, coronary angiography has less sensitivity for detecting CAV. The diagnosis of CAV was established on postmortem explant biopsy. The clinical presentation of “depression” in heart transplant recipients may not be a classic one. Instead, they may present with regression, agitation, irritability, or demanding behaviour. Therefore, we did not use the diagnostic and statistical manual IV criteria to classify patients into depression; instead, we included patients who were diagnosed having depression by the consulting psychiatrist. All three patients had preoperative depression as well. Escitalopram was successful in treatment for two patients. The third patient, unfortunately, did not survive >30 days. Havik et al. have reported poor outcomes after heart transplant in depressed patients. In comparison to the international statistics complications with the initial period of 2014–2015 in our cohort is high though from 2016 to 2017, the complication rates have come down dramatically. A report published by International Society of Heart Lung Transplant in the year 2014 documents postheart transplant survival at 1 and 5 year as 84.5% and 72.5%, respectively. When comparing results between different institutions, confounding factors such as surgical expertise, socioeconomic status of recipients, ethnicity, postsurgery social support, and cost of treatment influence the results. The association of the annual number of heart transplants and outcomes at a center is well established by many studies.,,, In our cohort, the main reason of increased complications in the first half of the study is the seemingly low volume of transplant surgeries. Shuhaiber et al. categorized centers on the basis of median annual transplant volume into very low (5 per year), low (16 per year), medium (28 per year) and high volume (48 per year) centers. They demonstrated that risk-adjusted 1-year survival was better in high volume centers. The United Network for Organ Sharing (UNOS) Scientific Registry in 1994 reported an increased risk of mortality at 1 month (40%) and 1 year (33%) in centers performing <9 heart transplants per year between 1987 and 1991. Another report from Weiss et al. published for UNOS in 2008 found similar association between volume of transplant surgery at center and short-term mortality. A single-center study performing cardiac transplantation in adults with congenital heart disease found an increase in 5-year survival from 50% to 69% with increasing experience of the personnel. In India although the donation rate is increasing, so is the number of centers performing heart transplants. Therefore, maintaining a respectable annual average volume (12–15/year) of heart transplants per center is difficult. It is imperative to keep in mind when allowing super specialty centers to develop individual transplant programs that a single center performing 20–30 transplants per year will have better outcomes than 4 or 5 centers performing 4–6 transplants per year. While re-evaluating licenses, it may be prudent to reconsider the usefulness of a smaller underperforming center in the vicinity of a more experienced tertiary care center. In our study, infection was the most common adverse event after transplant followed by rejection and PGD. Increasing the number of transplant surgeries will improve outcomes. Venugopal P. The first successful heart transplant in India. Natl Med J India 1994;7:213-5. Transplant Centres in India. Available from: http://www.mohanfoundation.org/transplant-centres/index.asp. [Last retrieved on 2017 Jul 14]. NOTTO, National Organ and Tissue Transplant Organization. Available from: http://www.notto.nic.in/index.htm. [Last retrieved on 2017 Jul 14]. NOTTO, National Organ and Tissue Transplant Organization. Available from: http://www.notto.nic.in/about-us.htm. [Last retrieved on 2017 Jul 14]. Costanzo MR, Dipchand A, Starling R, Anderson A, Chan M, Desai S, et al. The international society of heart and lung transplantation guidelines for the care of heart transplant recipients. J Heart Lung Transplant 2010;29:914-56. Kobashigawa J, Zuckermann A, Macdonald P, Leprince P, Esmailian F, Luu M, et al. 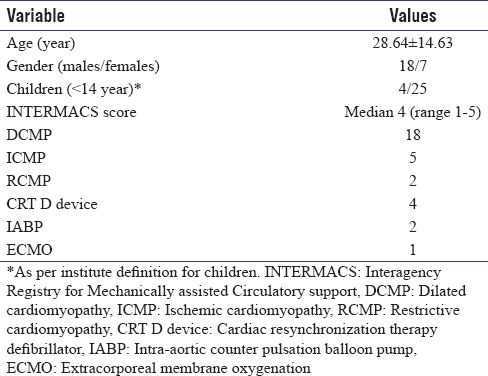 Report from a consensus conference on primary graft dysfunction after cardiac transplantation. J Heart Lung Transplant 2014;33:327-40. Seguchi O, Fujita T, Murata Y, Sunami H, Sato T, Watanabe T, et al. Incidence, etiology, and outcome of primary graft dysfunction in adult heart transplant recipients: A single-center experience in Japan. Heart Vessels 2016;31:555-62. Hertz MI, Taylor DO, Trulock EP, Boucek MM, Mohacsi PJ, Edwards LB, et al. The registry of the international society for heart and lung transplantation: Nineteenth official report-2002. J Heart Lung Transplant 2002;21:950-70. Ramzy D, Vivek R, Brahm J, Santiago M, Delgado D, Ross HJ, et al. Cardiac allogaft vasculopathy: A review. Can J Surg 2005;48:319-27. Hoang K, Chen YD, Reaven G, Zhang L, Ross H, Billingham M, et al. Diabetes and dyslipidemia. A new model for transplant coronary artery disease. Circulation 1998;97:2160-8. Van Balkom RH, van Der Heijden HF, van Herwaarden CL, Dekhuijzen PN. Corticosteroid induced myopathy of the respiratory muscles. Neth J Med 1994;45:114-22. Pereira RM, Freire de Carvalho J. Glucocorticoid-induced myopathy. Joint Bone Spine 2011;78:41-4. Alshekhlee A, Kaminski HJ, Ruff RL. Neuromuscular manifestations of endocrine disorders. Neurol Clin 2002;20:35-58, v-vi. Miller ML. Glucocorticoid-Induced Myopathy. 2009 Up to Date, Version 16.3; 2009. Askari A, Vignos PJ Jr., Moskowitz RW. Steroid myopathy in connective tissue disease. Am J Med 1976;61:485-92. Wright AA, Zhang B, Ray A, Trice E, Balboni T, Mitchell SL, et al. Maciejewski PK. Prigerson HG. Associations between end-of-life discussions, patient mental health, medical care near death, and caregiver bereavement adjustment. JAMA 2008;300:1665-73. Havik OE, Sivertsen B, Relbo A, Hellesvik M, Grov I, Geiran O, et al. Depressive symptoms and all-cause mortality after heart transplantation. Transplantation 2007;84:97-103. Lund LH, Edwards LB, Kucheryavaya AY, Benden C, Christie JD, Dipchand AI, et al. The registry of the international society for heart and lung transplantation: Thirty- first official adult heart transplant report-2014; focus theme: Retransplantation. J Heart Lung Transplant 2014;33:996-1008. Shuhbaier JH, Moore J, Dyke DB. The effect of transplant center volume on survival after heart transplantation: A multicenter study. J Thorac Cardiovasc Surg 2010;139:1064-9. Hosenpud JD, Breen TJ, Edwards EB, Daily OP, Hunsicker LG. The effect of transplant center volume on cardiac transplant outcome. A report of the United Network for Sharing Scientific Registry. JAMA 1994;271:1844-9. Weiss ES, Meguid RA, Patel ND, Russell SD, Shah AS, Baumgartner WA, et al. Increased moetality at low-volume orthotopic heart transplantation centers should current standards change? Ann Thorac Surg 2008;86:1250-60. Irving C, Parry G, Sullivan JO, Dark JH, Kirk R, Crossland DS, et al. Cardiac transplantation in adults with congenital heart disease. Heart 2010;96:1217-22.